SYRACUSE — There wasn’t a dry person or student upon the return of the first Wawasee Area Conservancy Foundation watershed rafting adventure Wednesday afternoon, Sept. 7. Wednesday was the first of three days for groups of Wawasee High School freshmen to take a little more than four hours out of their normal classroom schedule to learn in a different way. The results of rain on a watershed and where the pollutants go. The purpose of the adventure is to teach the students: lake history, stewardship, ecology of the lake and identify plants and animals. Retired teachers, elementary, middle and high school staff members, state troopers, school administrators are also participating in the outdoor learning experience. The event takes place at Between The Lakes — the newest education center for the WACF. Arriving shortly after 10 a.m. 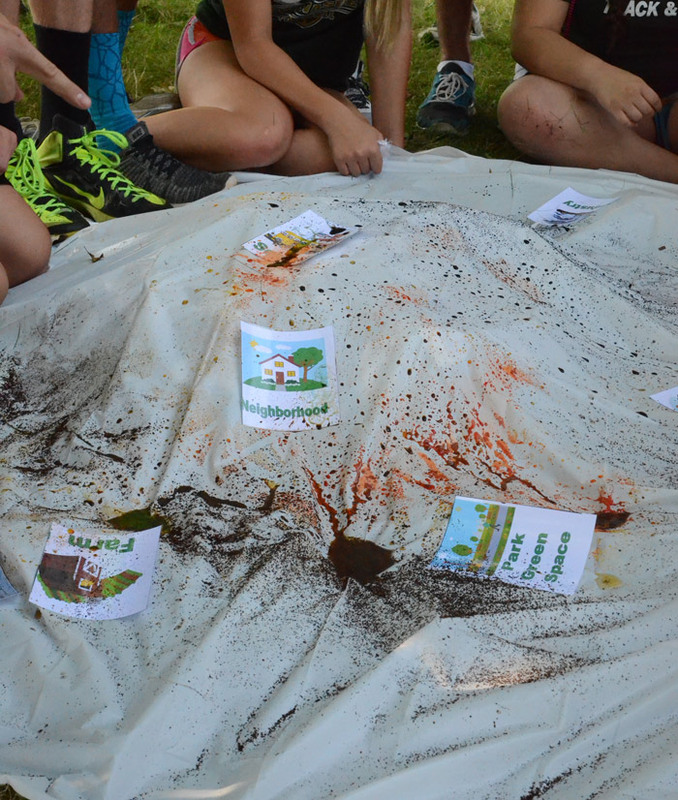 The students were divided into two groups where a watershed was created. “Think of the watershed as a funnel,” instructed Schumm. “The water starts at the top of the funnel and runs down. If you were a farmer where would you build a farm?” The students determined where locations in a community should be placed. Locations included: a farm, confined feeding operations, industry, golf course, parking lot, business district, campground, landfill, neighborhood, school, lake resort and park green space. Pollutants from these locations that enter the lake daily were added. These included road salt, fertilizer, manure, acid rain, runoff and oil. Then the rains came. The students were able to see where the pollutants flowed and created lakes. The final step was showing how a wetland could absorb pollutants protecting the lakes and streams. 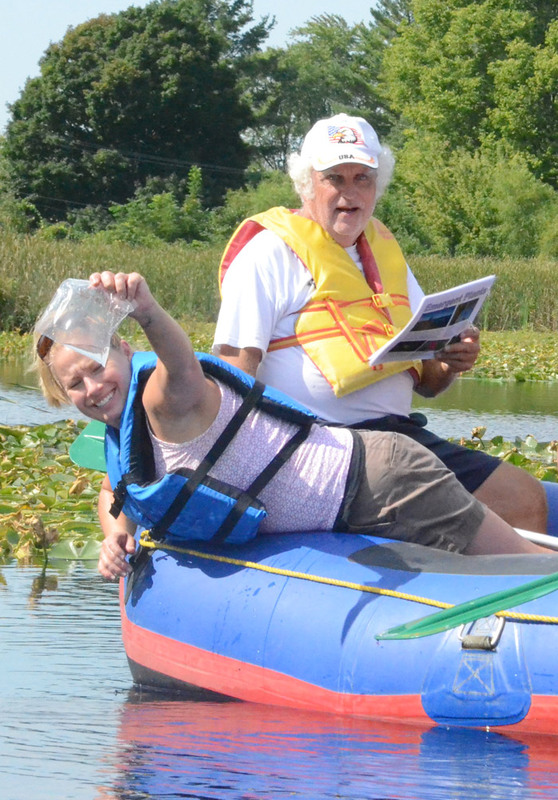 Seven rafts with groups of approximately eight took to the waters of Mudd Lake and Syracuse to learn about the watershed. Following lunch and rafting instructions by Indiana State Trooper Brooks Shirk, the group was divided into seven rafting groups. A field book was included covering emergent plants and other water plants, wildlife, glacial lake formations, and what’s happening in the water which included such water testing as turbidity, dissolved oxygen, nitrate/nitrite, phosphate and pH. Three test sites were marked for the tests. The book also included history of Wawasee and Syracuse lakes, the importance of wetlands, the fragile edges of wetlands, lake stratification and the cross sections of a lake. The plant collection included finding native plants such as: American pondweed, chara, leafy pondweed, northern waterilfoil, coontail and duckweed. 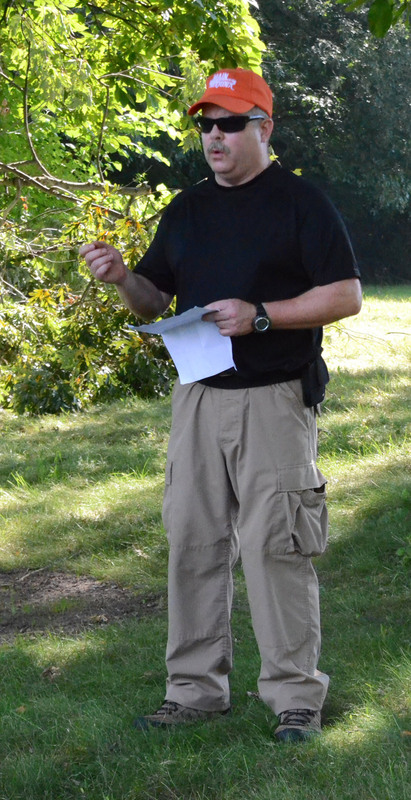 It also included finding such invasive species as curly leaf pondweed, starry stonewort, and Eurasian watermilfoil. The rafting trip also included team building activities on Syracuse Lake. These activities included a raft race and a water fight. The rafts, nine in all, paddles and life jackets were provided by the county Soil and Water Conservation district. Jim Tranter of the Wawasee Lake Patrol was also on hand in a patrol boat in case there were any incidents. A total of approximately 210 freshmen will participate in the experience. Peanut butter and jelly, cookies, orange, chips, and string cheese was provided by the school for lunch. Brooks Shirk explains the rules for rafting. Working together to put the rafts in the water. One of six samples of weeds found. Stopping in the wetlands at Mudd Lake, students learn a little about the area.